Hearts’ Scottish Cup fifth-round tie with Auchinleck Talbot has been scheduled for Sunday February 10, the club has confirmed. The cup clash was anticipated for a 3pm kick-off on Saturday, but Capital rivals Hibs are also at home against Raith Rovers, while Scotland face Ireland at BT Murrayfield in their first home tie of the 2019 championship on the same day. The match - a repeat of 2012’s meeting in which the Jambos defeated the Junior side 1-0 en route to winning the trophy - will kick off at 3pm. 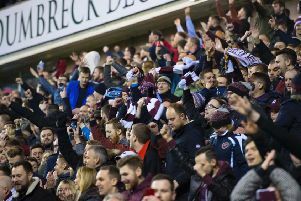 Hearts have confirmed they will open all three home stands for the match following consulation with fans, with Talbot being allocated 2,500 tickets in the Roseburn Stand.